At NASA's Kennedy Space Center in Florida, space shuttle Endeavour awaits its final liftoff from Launch Pad 39A. This story was updated at 4:58 p.m. EDT. CAPE CANAVERAL, Fla. — NASA officials have given the space shuttle Endeavour a "go" to launch on its final space voyage Monday (May 16). We had "unanimous consent from the mission management team to press on with the launch countdown," mission management team chair Mike Moses said during a briefing today (May 14). "We should be in really good shape for launch Monday morning." Weather forecasters predict a 70 percent chance the weather will cooperate for Endeavour's launch on Monday. "Overall, it's looking promising for launch, with a 30 percent chance of KSC weather prohibiting launch," shuttle weather officer Kathy Winters said. The main concerns at launch time will be winds at the emergency landing site here at KSC, and the chance of a low cloud ceiling, she said. This will be the shuttle's second launch try after an earlier attempt was foiled by a failed heater that insulates a critical power unit called an Auxiliary Power Unit (APU) on the shuttle. Mission managers have "really high confidence" the problem is fixed now, Moses said. "In our minds we are good to go and we have no problems expected with this APU heater anymore in this count." 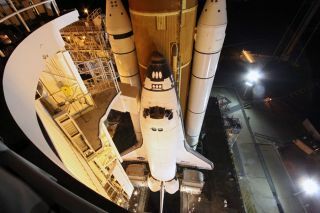 This will be the last mission for shuttle Endeavour, and the next-to-last flight of NASA's 30-year space shuttle program. Endeavour's goal is to deliver a $2 billion antimatter hunting experiment and a haul of spare supplies for the International Space Station. Endeavour will spend about 16 days in orbit on a mission that includes four ambitious spacewalks to pack away the spare supplies and upgrade the exterior of the station. Commander Mark Kelly will lead Endeavour's veteran crew of six astronauts. Kelly's wife, Congresswoman Gabrielle Giffords, D-Ariz., is expected to attend the launch in person despite having been shot in the head in January. Giffords is undergoing rehabilitation at a hospital in Houston.